I feel so rude! Andrea Joseph asked me a few weeks ago for an update on The Granola Thief and I keep forgetting to post one! Well, soon after my post in October the food thievery stopped cold, which makes me think perhaps the thief reads my blog....hmmm, perhaps I'm more famous than I thought :) Ha. So, I thought all was well and it was, until about two weeks ago (a week before my final project) when my jump drive, with a lot of my project on it, was stolen from the school's computer lab. Now normally, knowing myself, I would say that I misplaced it; however, in this case I know certain that it was stolen. Does the same person that likes granola, turkey sandwiches and half-eaten burritos like jump drives with half-finished projects on them? I can't say for sure. 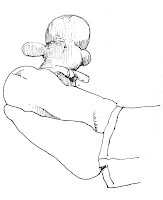 BTW, the illustration...nothing to do with the thief, just Edgar's feet and Pokey's favorite toy. weird goings on. lay a trap and lie in wait, catch the thief red-handed. or use an electronic tracker, that would be cool. or a dye like they say they use on banknotes. something like the clamp-thing they put on clothes in the store, sprays you good and proper when you prise it off, so they say. or, rat poison in the granola. I am so sorry to hear it continues. I second the notion for poisoned granola! absolutely nothing to do with the subject at hand, just thought I'd see what you were drawing. I'm thinking no rat poison, but maybe a mouse trap????? Like the die idea also, but in my case I'd forget and grab the granola and get my own trap back. I haven't been (drawing that is) and now I feel like I am at square one again. I been waylaid by charity crafting while watching television series on DVD. Happy Holidays and I'll keep checking in for inspiration to get drawing again.